Anne of Green Gables is a wonderful and timeless story which has been brought to life on quality cotton fabric by Penny Rose Designs. 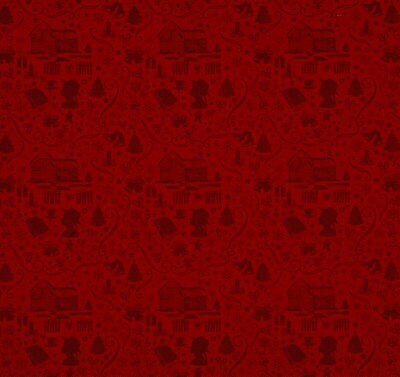 This rich cotton fabric in warm red tone on tone silhouette fabric is a perfect coordinate to our Anne of Green Gables Holiday scenic fabric we now have in stock. A must have for all fabric stashes! All fabric from The Quilted Nursery Children's Fabric Store is cut directly from the bolt in continuous yardage unless otherwise instructed. We now offer fractional yardage cuts for your shopping convenience. Same day shipping except holidays and Sundays! All shipping overages are refunded upon shipment of fabric. Loved the fabric. Shipped on time. Love it! Super fast shipping! Thank you!